Concasse comes from the French ‘concasser’, meaning to crush or grind, usually vegetables, but most particularly tomatoes. Tomato concassé is the flesh from fresh tomatoes that have been peeled, de-seeded and chopped into a dice. It is a staple of many professional kitchens used in sauces, omelettes, with olive oil, garlic, and basil as a topping for bruschetta and when added to Béarnaise sauce to make Choron sauce, served with fish and seafood. We remove tomato seeds and skin from Tomato concassé as in large quantities they can be tough, do not soften during cooking and leave a bitter flavour. If you can get hold of a moderate amount of ice it is very useful when cooling off the blanched tomatoes. Use fully ripe but firm tomatoes for the best results. The process may seem to be quite an effort but the end results for Tomato concassé are very pleasing and worthwhile. 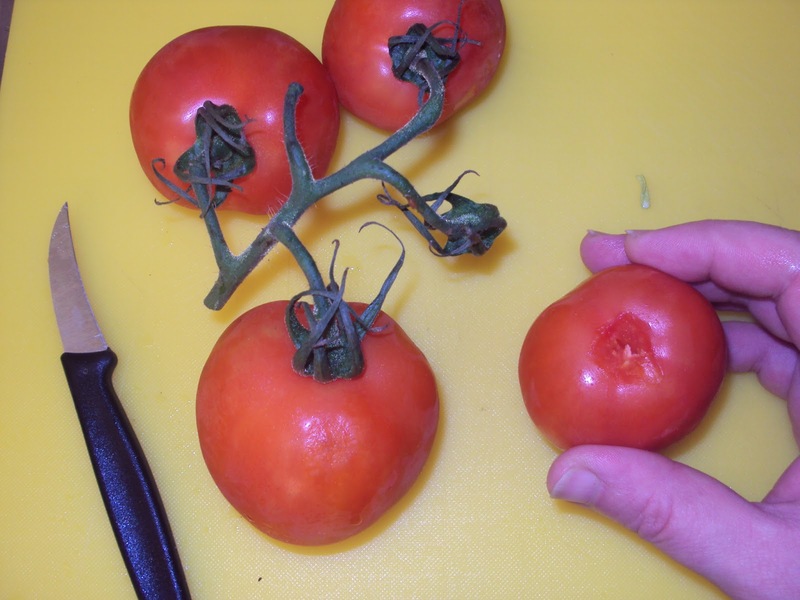 Bring a large pot of water, deep enough to generously cover your tomatoes, to a rolling boil.Take each tomato and using the tip of a small sharp knife or paring knife ( see picture ) remove the pith or tough part of the tomato where the stem used to be cutting out a circular hole. 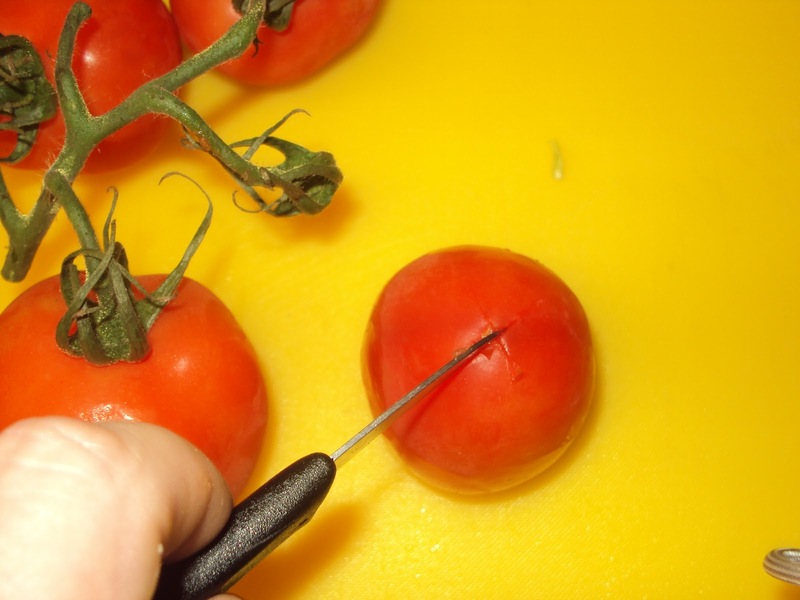 Turn the tomato over and on the other end mark a small cross in the skin with the knife. When all your tomatoes are prepared, place a four or five at a time into the pan the boiling water. As soon as the water returns to a boil cook for one-minute longer and then remove them using a slotted spoon or spider. 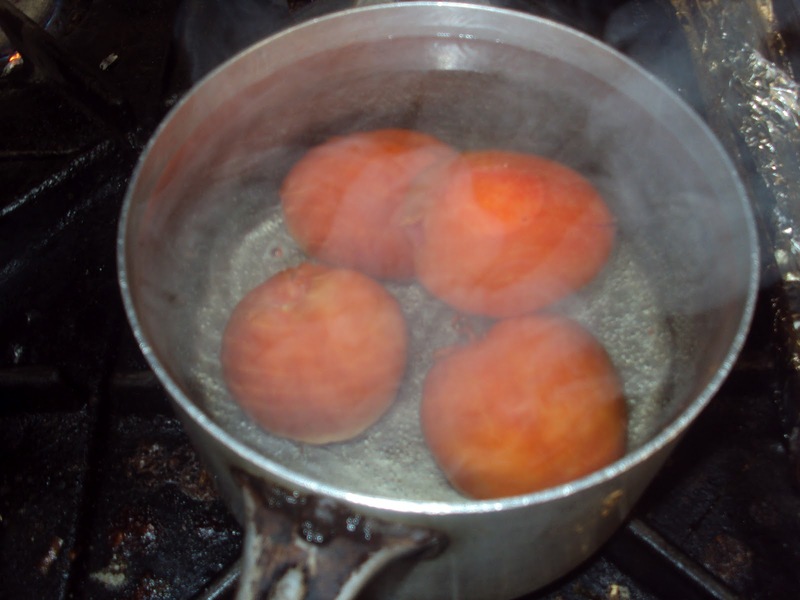 Immediately plunge the blanched tomatoes into a large bowl of very cold water to arrest the cooking process. If you have ice, use iced water. The cooking process depends on the size of tomatoes you are using, small tomatoes may only require thirty seconds simmering. A good rule of thumb is if you see the tomato skin beginning to peel off then take out and cool. The next step will take a little practice. Drain the blanched tomatoes then using the sharp knife again gentle tease and peel off the skin. Start by slowly sliding the tip of the knife under the cross you made in the skin earlier and work down. 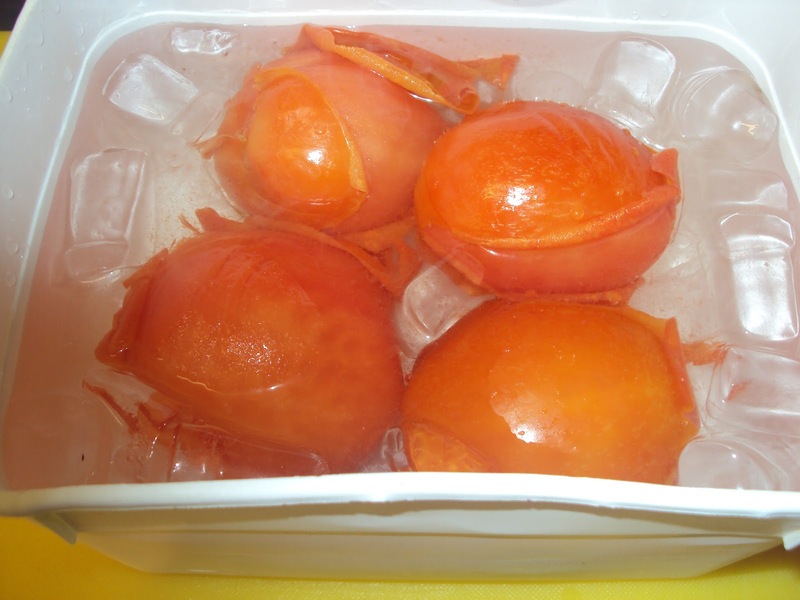 When peeled quarter the tomatoes and remove the seed with a small spoon or the back of the knife. Chop the quartered tomatoes into large or small dice as required.